Bone Gap High School "Cardinals"
Bone Gap (population 272) is located in southeastern Illinois in the eastern portion of Edwards County. There does not appear to be a major roadway leading into town. Edwards County Road 1 and County Road 1375 intersect at Bone Gap. The Illinois Central Gulf Railroad runs through Bone Gap from north to south. A town of reference in the area might be Lawrenceville located 25 miles northeast or Mt. Carmel located 12 miles to the east. Bone Gap was originally called Bon Pas (good path). 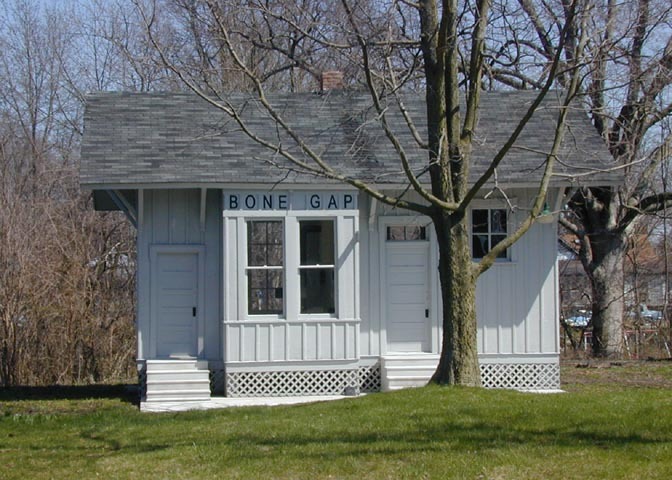 The name then evolved to Bon Gap (like Cumberland Gap), and eventually Bone Gap. "Bone Gap was founded on the site of an old Indian encapement.It was situated about half a mile East of the present site.There is evidence of a settlement in the area with arrowheads and pottery shards being found occasionally. Also more modern "remains" being pieces of brick and old dinnerware.The name was supposedly chosen because of an abundance of buffalo bones being found in a "gap" between 2 stands of trees.Thence the name "Bone Gap".Bon Pas is the name of the creek about a mile east of the settlement.The town was moved to its present location when the railroad came through (which has since been abandoned)." The history of Bone Gap's school system is being sought. 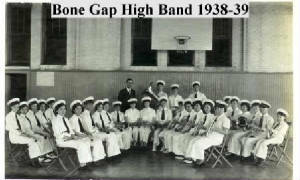 It is known that Bone Gap supported its own high school in the early 1900s. It was after the 1947-48 school year that Bone Gap High School joined a consolidation effort of several Edwards County schools. 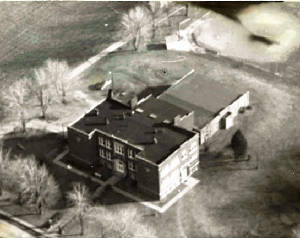 In 1948 a new school was established in Albion and named Edwards County High School. The kids of Bone Gap to this day are a part of the Edwards County School District. "Chris Kelsey here, I am the current Mayor of Bone Gap, and President of the Bone Gap Community Club. The old school still stands right across from my house. It is our understanding that it was the first consolidated school in the State of Illinois. With it's opening in the late 1800s it closed 5 local one room schools and consolidated them. A majority of the graduating class photos still hang in the building to this day. The school stopped being a high school in the early 50s or late 40s and was a junior high until the mid 60s. It remained a grade school until 1988. It was closed to consolidate a majority of the county into one school. 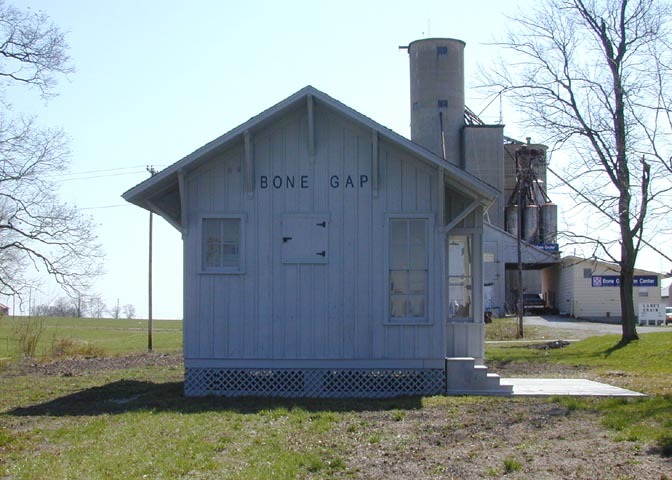 Today the Village of Bone Gap is seek grants and donations to convert the building into a museum of education history to make each classroom a display for every decade from 1890 until 1990 to insure the children of tomorrow understand how there parents and grandparents were educated. This is of course a tough battle, it is an old building and we have very limited resources. Many old school artifacts are stored either in the old school, or in the Restored Train Depot that I received a grant to restore in 2001. We have several newspaper articles and photos. My grandfather, father, brothers sisters and myself graduated from the school. We have a school reunion in Aug of each year to coincide with the Village Chowder. The major use of the building is now a Haunted house that we run the last two weekends in October every year, this is a big fund raiser for us as it brings in up to $5,000 each year." 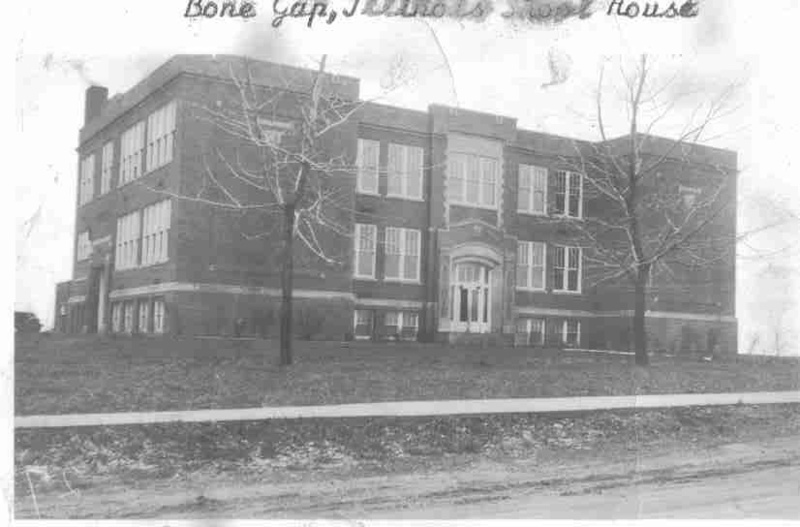 Former student and current Bone Gap pastor Dave Rigg tells us that though the Bone Gap High School technically closed in 1948, the school building continued to host the freshman class of Albion Edwards High School through the late 1950s. Bone Gap High School definately offered boys basketball. They probably offered baseball and track as well. As stated before very little is known other that assumptions we can gather from different internet sites. We are hopeful a resident or alumnus of Bone Gap High will help us fill in the "gaps". "I've talked with some former students (of Bone Gap High School). The name of the team may have been the Bulldogs back in the 1920s, but they were known as the Red Devils in the early 1930s. They became the Cardinals sometime in the late 1930s. They were still known as the Bone Gap Cardinals when the high school closed in 1949. The grade school which was closed sometime in the late 1980s was always known as the Cardinals." 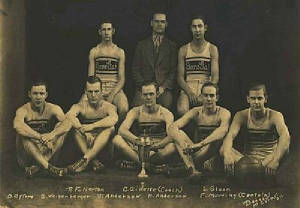 The photo of the boys basketball team of 1924-25 was lent to us by Don Worthen and http://www.genealogytrails.com/ill/edwards/basketball.htm . Site manager Laurie Selpien has done an excellent job in capturing a great deal of Edwards County history on this Geneology Trails website. 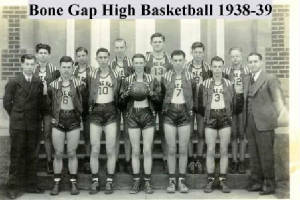 Bone Gap High School earned two District titles in boys basketball. Unfortunately the records and coaches names are currently not available. The years are listed below. Front row: Fred Fawkes, Ron Simmons, Bill Rigg, Jake Bunting, Ernie Thomason, Gene Hulfachor. 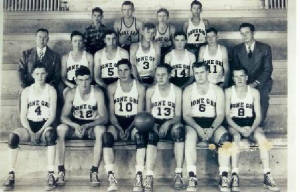 2nd row: Principal Alvin Brough, Vince Doty, Murvin Gill, Melvin Byford, Jim Scott, Junior Coale, Coach Marshall Provines. 3rd row: Herschel Root, Harol;d Brokaw, Victor Inman, and George Edward Root. **Note about the team of 1947-48: Ron Simmons is the father of Marty Simmons who led Lawrenecville to the State Class "A" Championship and was named "Mr. Basketball" in 1982. Marty went on to star for the Universitry of Evansville where he is now the head coach. Fred Fawkes scored 49 points in one game for Edwards County High School. He turned down a basketball scholarship at Tennessee. "The grade school Girls Volleyball team won the State Championship in 1988 (kinda like the movie "Hoosiers", but with volleyball) and was a Regional Champ several years. The boys basketball team held several regional and tournament titles in the 20s and 30s, they were good enough that money was raised and volunteers build a new gym in the 1920s. My grandfather ran one of the mule teams that dug the underground portion. The school had a Basketball team every year, Track team, Baseball some years. The girls played Softball and Volleyball."